You worry about your children’s teeth, eyes, and other parts of the body. You teach washing, brushing, and grooming, but what do you do about your child’s feet–-those still-developing feet which have to carry the entire weight of the body through an entire lifetime? 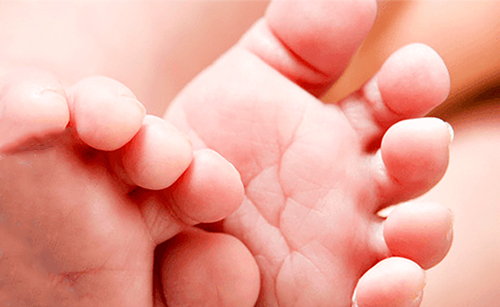 Podiatrists consider the first year of a child's life to be the most important in their development. The feet of a young child grow rapidly during the first year of life, often times reaching half of their adult foot size! This coupled with the fact that the human foot is one of the most complicated parts of the body containing numerous bones means a child's foot needs careful attention when pain or discomfort is present. Many adult foot ailments begin in childhood and may be present at birth. It’s important that your child’s feet get regular check ups from a skilled podiatrist who specializes in finding these particular ailments. Early and persistent pediatric foot care can remove or minimize these problems in later life. Neglecting foot health allows for other conditions to appear such as in the legs, back and neck. There can also be undesirable personality effects for a child suffering from foot pain: The child with troublesome feet walks awkwardly and stands with poor posture. As a lifelong result, the child may become shy, introverted, and avoid athletics and social situations. Consultation between the podiatrist, pediatrician, and other medical specialists may to resolve these related problems. Looking for the most complete children foot care in Miami? We invite you to make an appointment today with Dr. Sandra Gotman. Contact us to schedule your appointment. We are conveniently located in on SW 40th Street in Kendall. We work to make every aspect of your visit the most satisfying experience you’ve had. We treat patients of all ages, and our friendly staff strives to ensure a pleasant office visit. Miami Podiatrist Dr. Sandra Gotman provides each patient with the information you need to make good choices about your foot and ankle care. We don't simply want to tell you about your diagnoses; we also want to work with you to determine the best plan for treatment of your foot and ankle discomfort. We approach foot and ankle care with a humble, yet educated and experienced approach. Miami Podiatrist Dr. Sandra Gotman provides each patient with the information you need to make good choices about your foot and ankle care. We don’t simply want to tell you about your diagnoses; we also want to work with you to determine the best plan for treatment of your foot and ankle discomfort. Copyright © 2018 Dr. Sandra Gotman DPM. All rights reserved.